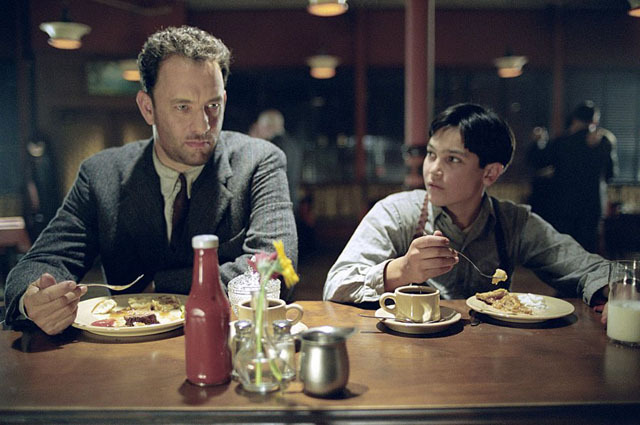 Road to Perdition, about a Mob hit man (Tom Hanks from Angels & Demons) who goes on the run with his son (Tyler Hoechlin of Solstice) after his son witnesses a Mob murder, is a well directed and produced film that’s beautifully shot, and all that comes through in this Blu-ray edition. The 2002 tense crime drama features universally good performances from Hanks, a young Hoechlin, Paul Newman (The Color of Money) as the Mob boss (Newman was nominated for an Academy Award for his performance), Jude Law (Repo Men) as a crime scene photographer, James Bond’s Daniel Craig as Newman’s son and Stanley Tucci (The Lovely Bones) as a Mob henchman. Most fans might not be too “astonished” by the Blu-ray, as some of the detail is lost in the film’s dark scenes, but Mendes is right when he lauds how the movie looks. From the ripples of the ocean in the opening scene to the rain drops in the final, the picture is clear and sharp. The movie’s bleak, textured look is preserved, but Blu-ray enhances what color there is, such as Newman’s magnetic blue eyes. As good as the video is, the high-definition sound is just as impressive. Road to Perdition‘s beautiful Irish-inspired score is sings through the speakers, and the many bullets fire out. The late Hall, who died in 2003, is remembered in the tribute featurette “A Cinematic Life: The Art & Influence of Conrad Hall.” It’s a well put together piece that explores the films of the three-time Oscar winner, including Butch Cassidy and the Sundance Kid and Search for Bobby Fischer. Mendes says about the latter that Hall made chess visceral and emotional because of the way he shot and lit the scenes. Mendes also talks about how much help Hall gave him during the filming of Mendes’ first movie, American Beauty, even reminding him that he has to say “Cut” at the end of a scene. The Blu-ray also extends the story of the movie with the feature “The Library: A Further Exploration of the World of Road to Perdition.” Viewers can click through for more information on different aspects of the story, such as crime scene photographers, such as those who inspired the character played by Law. There’s also information on the real Chicago gangsters of the time, such as Al Capone. Info is given through text as well as filmed interviews. The other three special features on the Blu-ray, a commentary by Mendes, deleted scenes and a making-of featurette, have all been on earlier DVD releases.